I’m going to be interested to see how many Liverpool fans read past the title of this piece. If commenting on this blog was something that people did I’m sure it would be full of Liverpool fans saying how ridiculous the banner is and how I, as a United fan are just jealous of their season and to get back in my box. Well here is something that a lot of Liverpool fans might not expect I think the banner that flew over Anfield on the final day of the season was an absolute joke. I’ve always described myself as a football fan first and foremost. Manchester United are my team, they have been since I first knew what football was and I will support them through good and bad times (and yes, this is really the first time in my life that you could consider bad although I’m sure Cardiff, Fulham and Norwich fans will tell me I have no idea what bad times are). Some might think that sounds kind of silly but let me explain the difference here. While I may have some fun with friends who support other football teams to me being a fan of football means that I can fully appreciate other teams, not just me own. I’m sure 90 percent of United fans still would never have a nice thing to say about Liverpool; the club or the fans I am someone who has openly said that if Liverpool son the Premiership title this year they deserved to and I would have applauded them for that, in the same way that today I applaud City. It’s about seeing above the rivalries, or at least not boiling them down to petty squabbling which is all too prevalent in football amongst fans. When I heard about the banner that flew over Anfield there was a part of me that found it funny, as someone who has a decent relationship with fans of other clubs, Liverpool fans included it’s the kind of thing I could say to someone who knows full well that I still appreciate Steven Gerrard as an all time great footballer. Those who arranged that banner would not have thought that, it would have been done because in their minds they think that the amount of trophies you win determine how good of a footballer you are. If you are someone who thinks trophies won equals fantastic footballer have a little look at some of these names: Anderson, Raymond Van Der Gouw, Karel Poborsky, Darren Ferguson, Fabio and Luke Chadwick. All of those United players have at least one Premier League winners medal. Does that make them great footballers? Certainly not. For the most part it is a testament to Sir Ale Ferguson that he won so many titles with such dross but the fact remains that regardless of the number of league titles Steven Gerrard has one he is still one of the best footballers of his generation and someone that I am glad to say I have seen play. This Man Has Four Premier League Winner Medals…My God. It’s been funny over the years watching United fans (myself included) get annoyed with Liverpool fans who keep talking about their past glories. When they weren’t fighting for titles you would still always get Liverpool fans taunting United when they slipped up and missed out on trophies. So you would have thought that now the tables have turned this season you would have thought that United fans would have just sat quietly but no, the roles have well and truly reversed. I’m really not saying there should be no banter between clubs whatsoever (apologies for use of the word banter) but nine times out of ten there isn’t any humour intended when fans of these two great clubs come together. 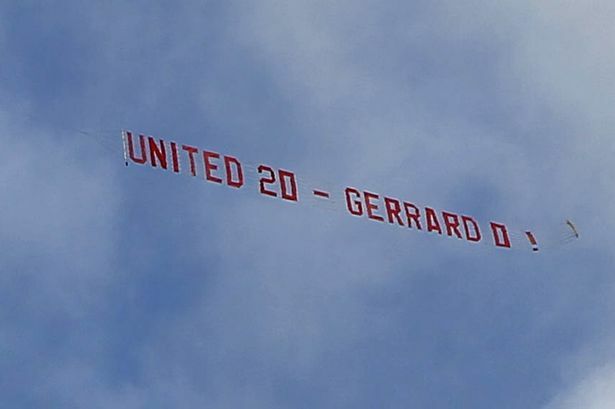 These people who flew the banner over Anfield genuinely believe Gerrard is an awful player and that him sticking with his boyhood club is something to laugh at. It isn’t. It’s been a fantastic season for those who love football. Yes your club might not have had the greatest season but from the top of the Premiership to the bottom of League Two we have been treated to some fantastic football, as well as some utter dross of course. Here is looking forward to next season, here is hoping United are back challenging for the title but firstly, here’s hoping for a great World Cup and let’s just remember that whatever team wins the tournament there will be some absolutely awful players.